Updated June 2018. In memory of Megan Curran. All cancer treatments and medications that are used today were, at one point, part of a clinical trial. Clinical trials can offer hope, particularly in complex diseases such as cancer. But getting access to them can be difficult, especially if patients have to travel a long distance to a hospital that offers trials. Clinical trials have very strict reporting and monitoring requirements. They are often available only at major medical centers. That’s why Huntsman Cancer Institute at the University of Utah recently opened clinical trials to cancer patients at two of its satellite clinics: the South Jordan Health Center and the Farmington Health Center. 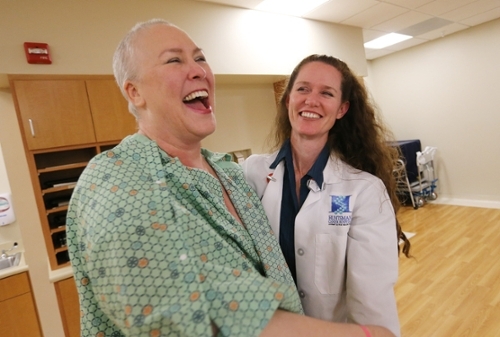 Megan Curran, a breast cancer patient and resident of Lehi, Utah, was able to participate in a clinical trial and get her treatments at the South Jordan Health Center. This convenience meant more time for Megan to spend with her family and friends. "Care close to home has helped me in so many ways—especially being a single mom. It makes it easier for a family member or a friend to come with me to every treatment,” Megan said. Visit the clinical trials website and talk to your care provider to learn more about clinical trials.